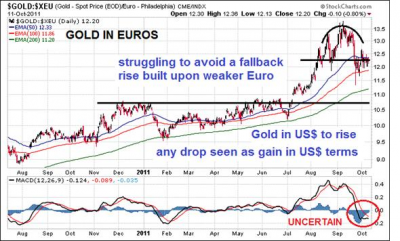 Gold is traditionally the store of value to which investors turn in times of instability. Its price goes up and down just like other investments, but it does not tend to fluctuate as much as shares, it is not threatened by inflation and it is accepted all over the world. 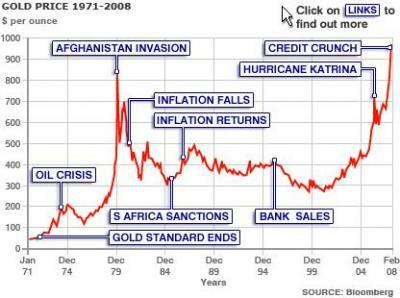 The recent peaks and troughs of the gold price occurred at some of the key moments in economic history. Struggling to pay for the cost of the Vietnam war, President Richard Nixon abandoned the so-called "gold standard". The dollar had been fixed at a rate of $35 to an ounce. 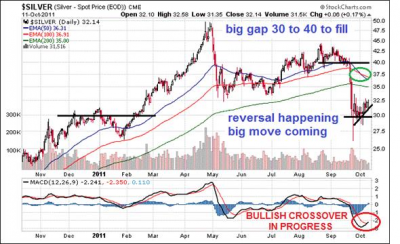 That peg was dropped and gold started to rise. The oil crisis caused a global surge in inflation. In the US inflation hit 11%, and investors bought-up gold to protect themselves. 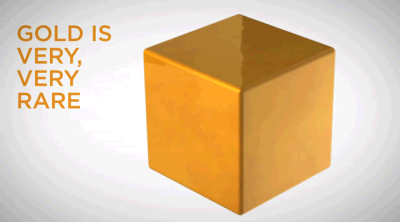 Gold is viewed as a safer investment because it keeps its value better than many other assets, such as shares. Gold finished the year 63% higher. International political tension soared after the Soviet invasion of Afghanistan. Gold hit a record of $850 an ounce on 21 January. Gold prices started to fall as investors regained some confidence in the US economy and the dollar. Inflation also began to slow. Western nations imposed sanctions on South Africa in protest over its apartheid laws. Gold prices jumped 23% between July and October as traders worried that South Africa might cut gold exports in retaliation. The gold price broke $500 per ounce for the first time in five years as inflation accelerated again in the United States. Gold prices fell on news that the International Monetary Fund had been considering selling 5 million ounces to help pay for debt relief in the developing world. Central banks started to follow the IMF's lead. The Swiss Central bank announced a plan to sell 1,400 tonnes of gold, Australia also sold a large part of its reserves. The British government sold more than half of its gold - almost 400 tonnes - of gold between 1999 and 2002 raising $3.5bn. It was poor timing for all the banks as in July 1999 gold hit a 20-year low of $252.80 an ounce. Hurricane Katrina boosted oil prices and raised fears that a period of quicker inflation was returning. By December 2005 gold was at $536.50 an ounce, the highest level in 24 years. The weak dollar also helped boost gold throughout 2006. Investors bought gold as a safe haven amid the growing financial crisis. The falling dollar and rising global inflation also boosted the metal.